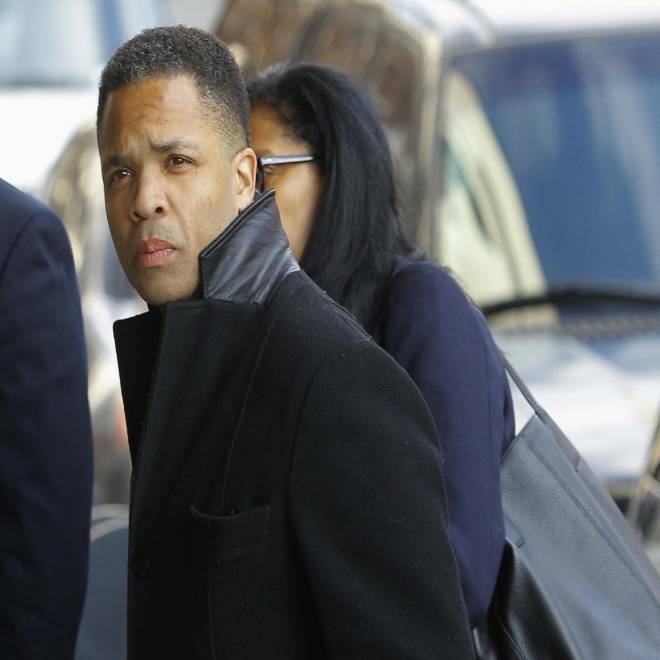 Former Chicago congressman Jesse Jackson Jr. enters the U.S. District Federal Courthouse in Washington on Wednesday. Former Illinois Congressman Jesse Jackson Jr. pleaded guilty in federal court Wednesday morning to misusing more than $750,000 in campaign cash on private expenses -- including a $43,000 Rolex, Blu-ray players, health clubs, lavish vacations, furs, and a slew of luxury goods. "For years I lived off my campaign," Jackson said in court as he fought back tears. "I used money that should have been for campaign purposes for personal purposes." "I'm not bound by the sentencing guidelines," Judge Robert Wilkins said. "The sentencing guidelines are advisory and they are something I am bound to consider." By way of explaining his decision to plead guilty, Jackson said, "I have no interest in wasting the taxpayers' time or their money." "I'm guilty, your honor," a visibly emotional Jackson said. Admitting that he took money received in political contributions, former Illinois Congressman Jesse Jackson Jr., pleaded guilty in federal court to misusing campaign cash for personal expenses. NBC's Pete Williams reports. Jackson and his wife siphoned off $580,000 from the campaign war chest for a wide range of credit card transactions, including $60,857.04 at restaurants and lounges and $31,700.79 for airfare. The bevvy of pricey goods Jackson allegedly bought with campaign funds also include a $4,600 fedora from Michael Jackson's collection, a $1,500 cashmere cape, and a pair of mounted elk heads from a Montana taxidermist priced at $8,000. According to the court filing, other purchases included "high-end electronic items, collector's items, clothing, food and supplies for daily consumption, movie tickets, health club dues, personal travel and personal dining expenses." As he exited the courtroom, Jackson, who left office last November after 17 years in his post, opened up to a reporter. "Tell everybody back home I'm sorry I let 'em down, OK?" he reportedly said. Jackson's attorney, Reid Weingarten, told the judge that he plans to make the case at this summer's sentencing hearing that his client's mental health conditions might be mitigating factors. "That's not an excuse. That's just a fact," Weingarten said outside the Washington, D.C., courtroom, adding that he anticipates Jackson will rebound and have "another day," according to the Chicago Sun-Times. Jackson's wife, Sandi Jackson, pleaded guilty three hours after her husband's hearing to a single charge for filing false tax returns and reporting less income than she accrued. The charge comes with a maximum prison sentence of three years. But Sandi Jackson's lawyer, Tom Kirsch, said a negotiated plea recommends a more lenient punishment, according to NBC Chicago. Her case Wednesday afternoon was heard by the same judge who presided over her husband's hearing. Sandi Jackson resigned in January from her post as Chicago's 7th Ward alderman. The couple was joined in court by Jackson's father, civil rights icon Rev. Jesse Jackson; his brothers, Jonathan and Yusef; his sister, Santita; and Sandi sister, Tina. Rev. Jackson on Monday said his son still struggles with mental illness and remains under "tight medical supervision." "During this difficult and painful ordeal, our family has felt the impact of your prayers and calls," Rev. Jackson said. "So many ministers have reached out to us, and we thank you. The hurt in this valley is indescribable." Jackson's guilty plea caps off a dramatic downfall. At the apex of his political career, Jackson was a leading figure in the Democratic Party establishment, serving as a national co-chairman of President Barack Obama's 2008 presidential campaign and as a surrogate for other high-profile politicians.